I don’t know about you, viagra 40mg but I’m so ready for summer. Long, help hot days at the beach, flip flops and the smell of sunscreen, and cookouts. There’s no better way to end a day at the beach than with something grilled and a frosty beer. And you always need a good side dish for all of that grilled goodness. This potato salad is one of those things you can pull together in the morning let it hang out until you’re ready for it. Not only will it keep a long time, the flavors will actually get better. Pesto is one of those things everyone has had a hundred times and mostly it’s nice but not exceptional. I’ve always liked, but never loved pesto. Now I know it’s because I had never had really, truly good Italian pesto. And I think the secret isn’t in the olive oil or the basil. I think it’s the cheese. You gotta go for the aged Pecorino – the good stuff. None of that pre-grated Parmesan nonsense. That will get you merely passable pesto. I also skipped the garlic. I know what you’re saying – pesto isn’t pesto without the garlic. But I swear I didn’t taste any garlic in my Italian pesto, so I skipped it. And it was just perfect. I never thought I’d prefer something without the garlic, but I do. Now that you have your perfect pesto, a delicious side salad is easy. Pasta with fresh vegetables, whole grains, couscous or potatoes. You can put it on anything and your salad will be great. I chose potatoes and smoked salmon because that’s what I had. And now I have a lunch that I just can’t wait to eat! 8 oz. smoked salmon, cut into bite-sized pieces. Place the potatoes in a pot and cover with water. Set on medium-high heat and boil until the potatoes are soft, but not mushy. Cooking time depends on the size you cut your potatoes and the kind of potato you use, but it should be about 10 – 15 minutes. 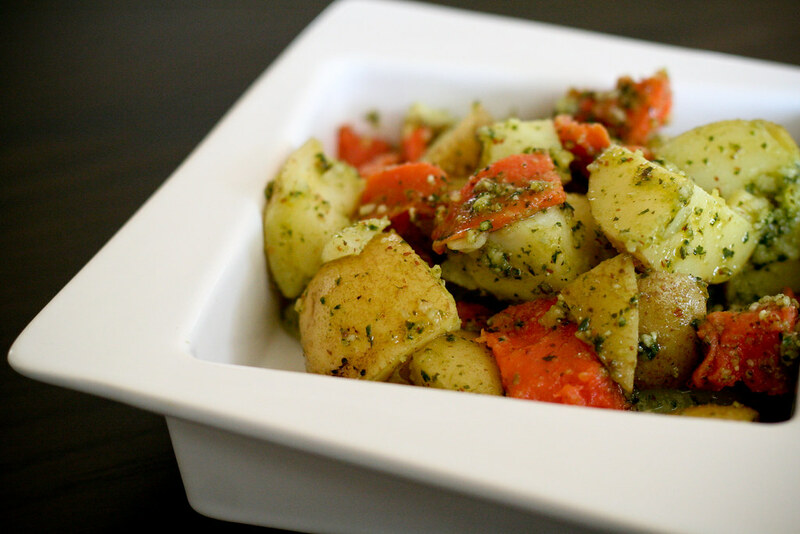 While the potatoes are cooking, make your pesto by placing all of the ingredients in a food processor or blender and pulsing until smooth. Carefully drain the potatoes in a colander, taking care not to mash them up, and transfer them to a big bowl. Let the potatoes cool to room temperature. Gently toss them with the smoked salmon and pesto. Eat right away or cover and refrigerate for up to 3 days. This looks great! I’m looking forward to trying it without the garlic. I like garlic, but sometimes it’s just too strong for my taste. I’d like to make this as a main dish–maybe with some sauteed greens on the side. I’m very tempted to add garlic, though! I’m going to try this recipe for memorial day bbq coming up. I was asked to bring potato salad, and I don’t do mayo, so this looks like a very nice alternative, the salmon bringing that rich quality. 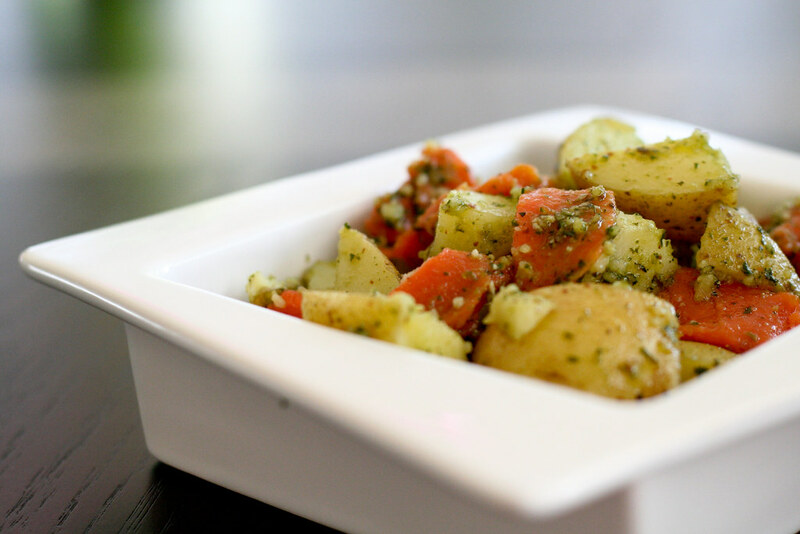 What a delicious looking and sounding potato salad recipe – one my dad (pesto) and my aunt (smoked salmon) would both agree on! Thank you! Great salmon recipe! I will definitely try this out! no garlic in the pesto? marcantonio – sometimes I skip the garlic in the pesto. I usually eat things like this at work and I don’t want to smell too much of garlic. Feel free to add a few cloves if you prefer.